Some of you may have been to one of my sessions at an MEA conference where I discussed methods of teaching music composition in guitar classes. In this series of blogs on composition I’m going to go into more detail on how to sequentially present composition skills to your students. 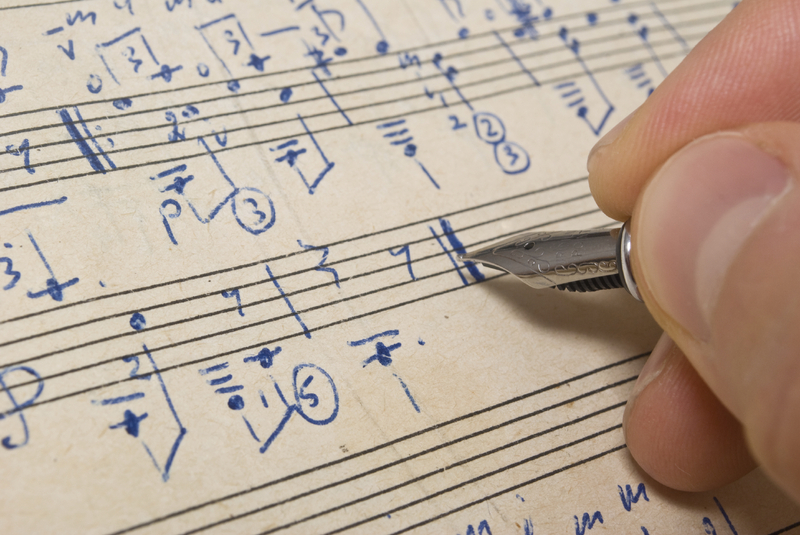 This is the first in a series of four blogs dealing with music composition. The first will show how you can have your students find the chords in major and minor keys. The second will show how to have your students write common popular chord progressions. The third will present how to embellish chords, and the fourth will deal with writing simple melodies. There are several methods of learning what chords go together in a key. You can explain to your students that chords in a key have things in common. One of those being they all contain notes from the same scale…leave it at that for now. Play some chords for them that are all in the same key, then throw in one that is outside the key and see if they can hear that it sounds like it doesn’t belong with the others. The easiest way to show students the chords that go together in a key is by using the chord clock shown below. 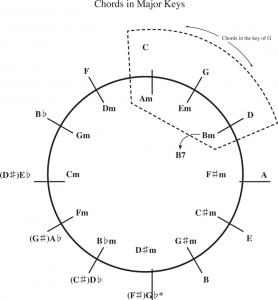 Most of you will recognize this clock as a modified circle of fifths. 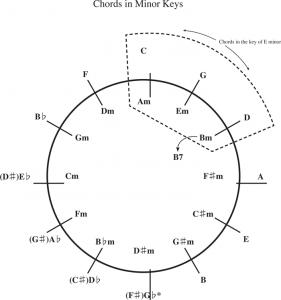 I’ve taken the circle of fifths and placed the relative minor chord for each major chord on the inside of the clock. To find the chords in a major key, simple locate the chord with the letter name of the key. Then take the chords clockwise and counterclockwise of the name of the key. Those three chords and the three chords on the inside of the clock connected to them give you the six basic chords in a key. On the clock above, you can see that the chords in the key of G are: G, C, D, Am, Em, and Bm. Some of you may say, “Wait a second…there are seven chords in each major key.” That’s true, but the seventh chord is diminished and is sort of a freak. It can be dealt with later. Most of the music your students have heard will probably not contain that chord. Point out to your students that the keys of G, C, and D contain the easiest chords to play on the guitar. As you keep moving to the right or left, more difficult chords are introduced in each key. Now that the students know how to find chords in a major key. Have them write all or some of the chords in a key they select in any order and have them strum the chords however they would like. You want them to feel free and creative. The rules of progressions can be dealt with later. To find the chords in each minor key, a similar method is used that was used for the major keys. Select a minor chord on the clock that has the name of the key. Take that chord and the two chords on each side of it. Then, select those three chords and the three major chords connected to them that are on the outside of the clock. A big difference here between finding the chords in a major key and a minor key is that in a minor key, after selecting the six chords that go together, change the chord that is clockwise of the key into a major chord, and it is often a 7th chord. On the clock below, the chords in the key of E minor have been selected. Notice that the Bm chord has been changed to a B7 chord. Now, have the students write the chords in a minor key in any order they would like. At first, have them stick to using the chords in a minor key that are on the inside of the clock. This will keep it simple. Have the students strum the chords using any pattern(s) they would like. Although the students might have a limited repertoire of chords, they should be encouraged to write progression in more than just one key, even if they only use the chords they know in a given key. Introducing a new chord in a key is a great way to have the students expand their chord arsenal. After the students have experimented with the order of chords, they can select a time signature and write chords above measures. The student should select a strum pattern that works for the time signature, and each chord can get as many measures as desired. At first, it may be best to have the students write progressions that only contain one chord per measure and probably multiple measures of one chord. It’s important that they can play what they have written. Later, students can put two chords in some of the measures if they like. Next, I’ll talk about writing common progressions and the natural progression of chords. Until then, have fun letting your students experiment with the world of chord progressions. Thanks so much for sharing this. I have been cruising along with developing composition curriculum in piano classes but always struggled with introducing it in guitar classes. It is helpful to simply look at the same concepts of the composition through a guitarist lens. I am looking forward to the next few blog posts! This is fantastic! Will be a great addition for some of my classes. Looking forward to the next installments!